In his second starring role, following the previous year’s Captain Blood, Errol Flynn cemented his claim to superstardom. His quick success owed much to his good looks, his natural charm (especially in the scenes with Oliva de Havilland), and his ability to portray a convincing leader. Audiences believed it when he asked men to follow him—even to their deaths—in this film, They Died With Their Boots On, and Rocky Mountain. The Charge of the Light Brigade takes place in India in 1854 during the Crimean War between Russia and England (and other European countries). An unstable political situation becomes worse when England withdraws financial support from Surat Khan (C. Henry Gordon), the influential leader of the Suristani tribesmen. Khan eventually pledges his allegiance to Russia and commits a ruthless act that sets into motion the charge of the film’s title. 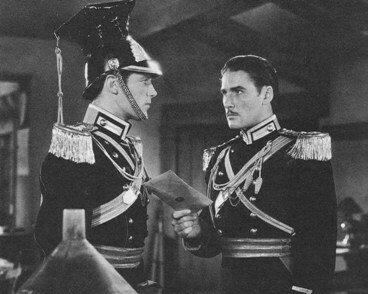 Against this backdrop of war, Major Geoffrey Vickers (Flynn) and his brother Perry (Patric Knowles) vie for the affections of Elsa Campbell (de Havilland). 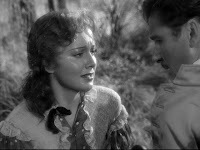 An early scene informs us (the audience) that Elsa, though engaged to Geoffrey, has secretly fallen in love with Perry. This knowledge causes us to empathize with Geoffrey as his emotions evolve from disbelief to anger to understanding. Geoffrey’s scenes with Elsa are all the more touching, because as he professes his love, we know she is consumed by guilt. On the surface, The Charge of the Light Brigade comes across as a well-crafted action film with a love triangle subplot. But it also offers a subtle commentary on the military mind. At one point in the film, Vickers follows orders against his better judgment—because following orders is what officers do. The result is a bloody massacre that haunts Vickers and his men. When an opportunity for revenge arises later, Vickers chooses not to follow orders, an act that results in both tragedy and triumph. Warner Brothers lavished high production values on The Charge of the Light Brigade, although it’s too bad it’s not in color. Max Steiner’s marching musical score is inspirational. The cast is top-notch (though Nigel Bruce is perhaps too silly for a Army colonel). And, under the sure hand of director Michael Curtiz, the climatic charge is impressive and exciting. It was filmed in San Fernando Valley during cold temperatures. Both Errol Flynn and co-star David Niven describe the difficult production in their entertaining autobiographies My Wicked, Wicked Ways (Flynn) and Bring on the Empty Horses (Niven). The title of the latter book is attributed to Curtiz, who frequently shouted to the film crew to "bring on the empty horses" to portray the number of fallen lancers during the charge. Sadly, trip wires were used to cause the horses to stumble, which sometimes caused injuries so severe that the animals had to be killed. Humane societies, including the Society for the Prevention of Cruelty to Animals, sent formal complaints to Warner Bros., which ultimately resulted in measures to monitor animal scenes during film productions. Charge is one of the few Flynn hits never re-released by Warner Bros., largely because of the concern over the treatment of horses during the climatic charge. Charge of the Light Brigade was the second of nine Flynn-de Havilland films. Ironically, Anita Louise was originally cast as the female lead and Olivia was a last minute replacement. 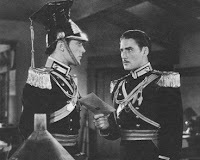 Flynn and Patric Knowles would appear in three additional films together (Patric's biggest roles were probably in Charge and Four's a Crowd). Flynn and Niven reteamed again for The Dawn Patrol. Finally, although they famously didn't get along, Flynn and Curtiz made twelve films together, if one counts the Perry Mason mystery The Case of the Curious Bride (in which Flynn is the corpse and shown briefly in flashback). In 1968, Tony Richardson (Tom Jones) directed another version of The Charge of the Light Brigade, which was not technically a remake. Though based on the same historical incident (and also borrowing the title of Alfred Tennyson's famous poem), it's an anti-war film with a satirical edge. Trevor Howard and David Hemmings were the stars. Though probably more accurate, I much prefer the Curtiz-Flynn version. Rick, great post. The love triangle added an extra layer to this film. IMO, David Niven was the best part of this film, but Flynn did a fine job portraying an officer conflicted by honor in romance and on the battlefield. Great write-up Rick, for one of my favorite Flynn films. Paul is right about the Steiner score. In addition to the Marco Polo recording, which has highlights, the recording team of John Morgan and William Stromberg recorded the entire score for their Tribute label. Marvelous, marvelous recording. I've always been intrigued that Flynn and deHavilland are seen as the ideal storybook adventure film couple, but they only wind up together in about half their films. If memory serves, Olivia also winds up with Patric Knowles in the screwball comedy "Four's a Crowd." Rick, this is a powerful film based on an unforgettable work by Tennyson. Like Kim, I was also quite fond of David Niven. About 25 years ago, I read his "The Moon's a Balloon" and "Bring on the Empty Horses." Although I liked the love triangle very much, it is the story of following and not following orders that made the biggest impression on me. The information about the injuries to the horses is so sad. I am pleased that it caused watchgroups to monitor the safety of animals used in films from then on. Great post, Rick, on a very memorable film. Kevin,Thanks for the "heads up" on the complete score . Is that with the Moscow Symphony Orchestra? I have most of the Stromberg's in the Naxos Film Music Classic series. It's not Charles Gerhardt and the National Philharmonic's Classic Film Scores series on RCA(With George Korngold Eric's son as productor and the great K.E. Wilkinson as engineer)but pretty darn good stuff. Flynn was really bothered by the treatment of horses and contacted the SPCA. In the real charge of the Light Brigade at the Battle of Balaclave, 673 men and horses charged. At the end there was a mounted strength of only 195. 247 men were killed and wounded. 475 horses were killed and 42 wounded. On a "lighter" note, in the same battle there was another charge of the Heavy Brigade that was extremely successful. Paul & Kevin, I have a vinyl copy of "Now, Voyager: The Classic Film Scores Max Steiner" by the National Philharmonic Orchestra. 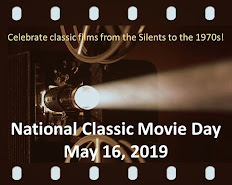 It has the march from CHARGE OF THE LIGHT BRIGADE, plus KING KONG, JOHNNY BELINDA, THE BIG SLEEP, and other memorable scores. I'd love to find a CD of Steiner's music from A SUMMER PLACE, PARRISH, and SUSAN SLADE--three terrific later works. Panavia999, thanks for the historical info. Toto and Kim, I also enjoyed Niven in this film and in DAWN PATROL. He and Errol were a fine team. Rick, this is an outstanding review on a great movie. I have seen this movie many times and consider it one of Flynn's best performances. I agree with Paul and Kevin about how beautiful Steiner's score is. I also agree with Toto's comment on how the decision to follow or not follow orders was the key part of the plot for me. I, too, have read about how some of the horses were killed. Flynn was horrified the way they were treated and protested. Because of this film people began to look at how animals are treated in movies. Flynn not only loved horses but was an expert rider. I love to ride horses myself but no way can I sit a horse like Mr. Flynn. I enjoyed your review and everyone's comments. Rick, This is a wonderful review!! I have not seen, The Charge of the Light Brigade . I was sad to read about the treatment of the horses. Like Toto, I'm glad they now have watch groups to protect animals in film. Rick , your LP is a film music classic, (I have it too) never get rid of it. BTW I did a search at Arkive music. I have good news and bad news. The good news is the Marco Polo CD I spoke of is on sale for $9.99 (a steal) , but nothing I can recommend for your other 3 titles. Dawn ,YOU HAVE TO SEE THIS FILM! Paul: Yes it's the Moscow Symphony performing the entire score. It's on two discs. There's even music from the film's promotional short. It's a magnificent performance of the final charge sequence. The players must have been exhausted when it was over. All of the Tribute label's recordings have been superlative. Kevin, thanks. I found it at Screen Archives Entertainment a very cool site for classic film music lovers. Though probably more accurate, I much prefer the Curtiz-Flynn version. So do I. 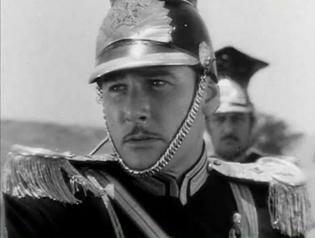 Especially due to Errol Flynn's performance as Geoffrey Vickers.